Here is an early design of my Panda placed on a couple of background ideas. Really horrible actually but I had to make them to find that out. Red Panda's eat Bamboo so I thought a natural place for him would be running up a Bamboo cane. This is a particularly large bamboo cane - which do exist but looks ridiculous here. Another app in development using a Red Panda character (working title "Pandaz" ). The last post I showed from the Red Panda app in development was of the 3D design style rejected and this is the same style but with background elements included. I like the green foliage barriers and the tree trunk. It may be better for something else another day. The new style is a lot more storybook and traditional. The tones are more muted and I am using brushes in Illustrator. It is a very 'flat' two dimensional design which is back 'in' now, which may be fortunate. 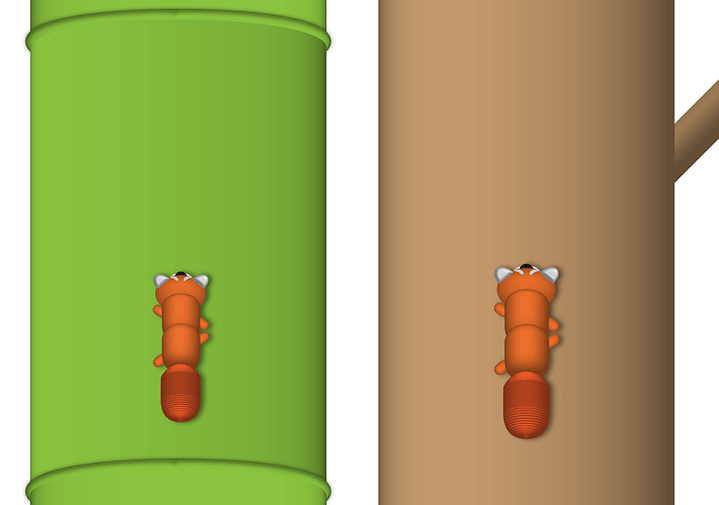 Another game in progress, centred around those ever popular Red Pandas, has seen a number of style changes. I started with a 3D character and even got to the walk cycle stage but feedback and some inspiration from some wonderful 50's styled illustration has resulted in a more suitable style (coming soon). The 3D characters had some worth however and the results are worth seeing. The walk cycle character reminds me of Catbus from Totoro...although it would need some more legs!